We are identified amongst the leading manufacturers, suppliers and exporters of an unparalleled range of Nitrogen Gas Generators. 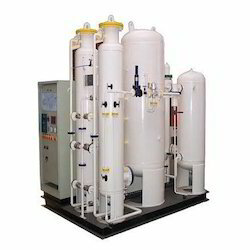 These nitrogen gas generators offered by us are known for producing nitrogen gas from the atmospheric air using pressure swing technology (PST). In addition to this, the offered range is widely acknowledged among the respected clients, owing to its reliable operations, safe usage, longer service life and easy maintenance. Our customers can avail a wide range of Nitrogen Gas Generators. These Nitrogen Gas Generators offered by us are manufactured using superior grade raw material, which is sourced from reliable vendors of the market. Additionally, the offered range is made using high grade stainless steel, which is sourced from reliable vendors of the market. This range is suitably customized in different forms and specifications, so as to meet the requirements of clients accordingly. Looking for Nitrogen Gas Generators ?